Representative Richard Humbert: Born in 1835’ in Savannah, Georgia, Richard Humbert was a carpenter by trade which found him at his stead until commencement of the war in Charleston, S.C. Following his defection to federal forces during the war, he served faithfully until its end obtaining the rank of sergeant. Afterward, he became a merchant, an attorney, building contractor, and minister. Lore has it, Rep. Humbert taught himself to write and that he wrote his way to freedom. He was a member of Darlington County's Delegation to the 1868' Constitution Convention, and afterward, served as a Representative from 1870-1876. He was commissioned in the the S.C. Guard by S.C. Governor Robert Scott as a Lieutenant Colonel in the Eighth Regiment . He was most notably known for his leadership in creating the local militia during the reconstruction-era within our region for protecting freedmen and republican politicians from reprisal of the KKK, Red Shirts, and their sympathizers. He was married to Lavinia and they had four children; Catherina, Frony, William, and Lizzie. 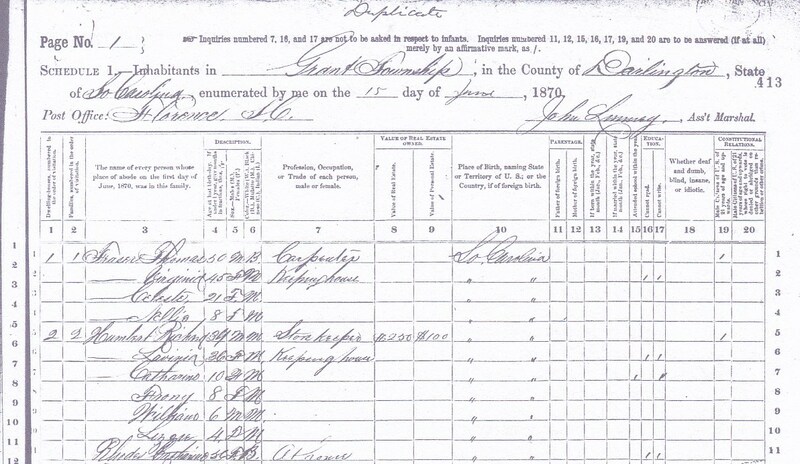 Richard Humbert's 1870 United States Federal Census - note second family. 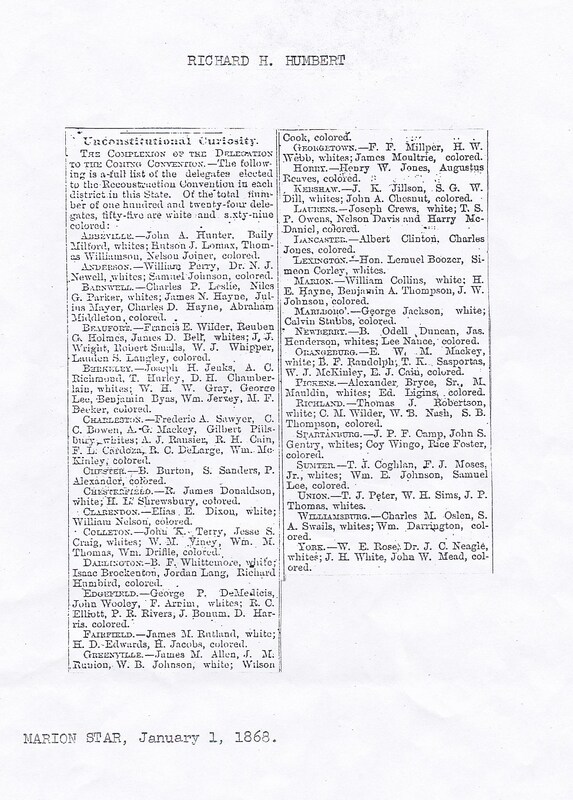 1868' S.C. Constitution Convention Delegate Publication – Marion Star January 1, 1868. 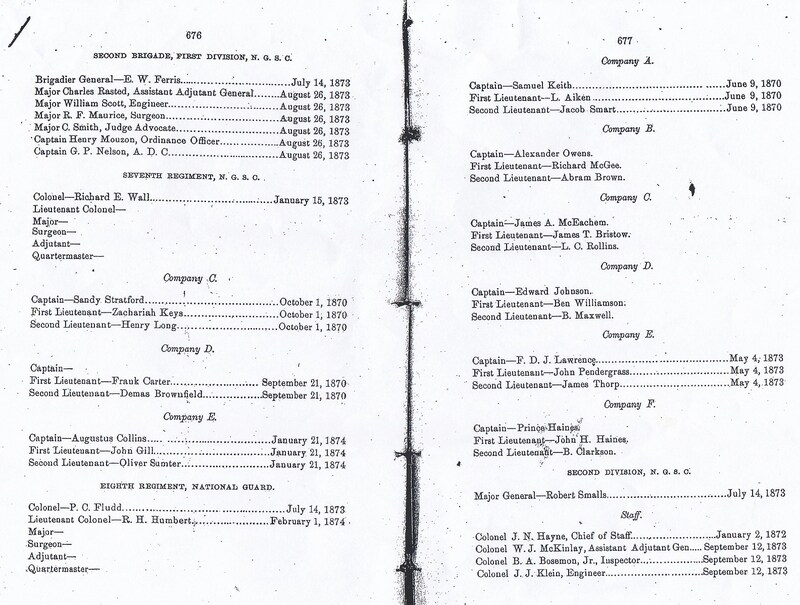 Adjunct and Inspector General Report of South Carolina – Eighth Regiment S.C. Guard Command Staff. 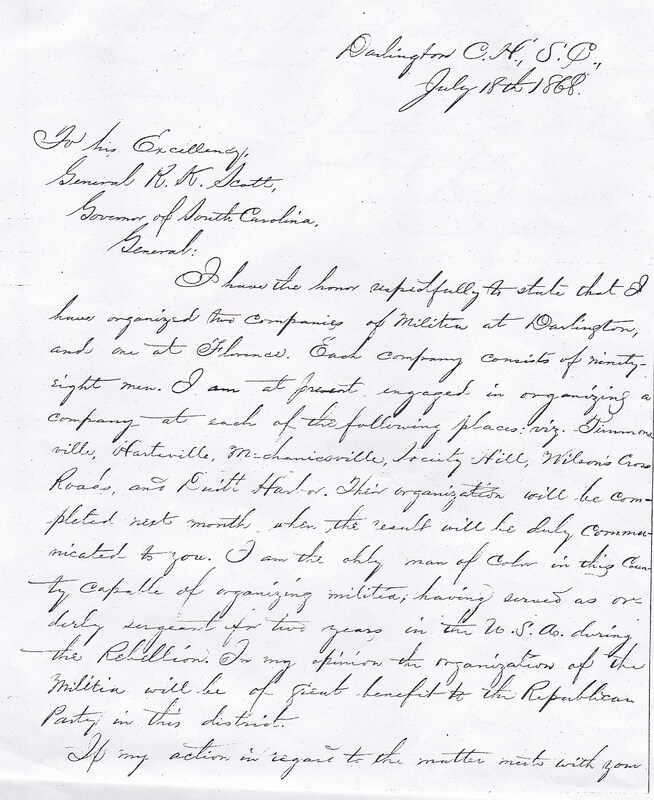 Rep. Richard Humbert's Letter to Governor Scott on Guard Status in Whittemore Township (Darlington).